Should you bargain with the Devil? In an age of terror, our national leaders face this sort of question every day. Should we negotiate with the Taliban? Iran? North Korea? What about terrorist groups holding hostages? In private disputes, you may face devils of your own. A business partner has betrayed you and now wants to negotiate a better deal. Your marriage is ending and your spouse is making extortionist demands. A business competitor has stolen your intellectual property. Your sister is fighting you over an inheritance. You are furious. Your gut tells you to fight it out in court. But when facing a devil—anyone you perceive as a harmful adversary—it may make more sense to negotiate rather than fight, says Robert Mnookin, the internationally renowned leader in the art of negotiation. How do you decide? 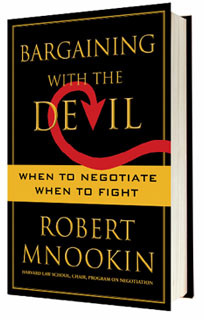 In his new book, BARGAINING WITH THE DEVIL: When to Negotiate, When to Fight (Simon & Schuster; February 9, 2010, $27.00), Mnookin explores the challenge of making such critical decisions. Using eight conflicts drawn from history and his own professional experience, he offers a framework that applies equally to international conflicts and everyday life. “There is no easy, categorical answer,” he warns. ”Sometimes you should bargain with the Devil and other times you should refuse. How in particular circumstances should you decide? The challenge is making wise decisions. This book shows you how.